I don’t have much to add to this press release by IDW Publishing, except for awesome! San Diego, CA (October 13, 2013) – IDW Publishing announced this morning its plan to expand their relationship with Darwyn Cooke and the Estate of Donald E. Westlake to include illustrated Parker novels. Cooke, who will continue producing his award-winning Parker graphic novel series for IDW, will now also illustrate Westlake’s ground-breaking crime novels. 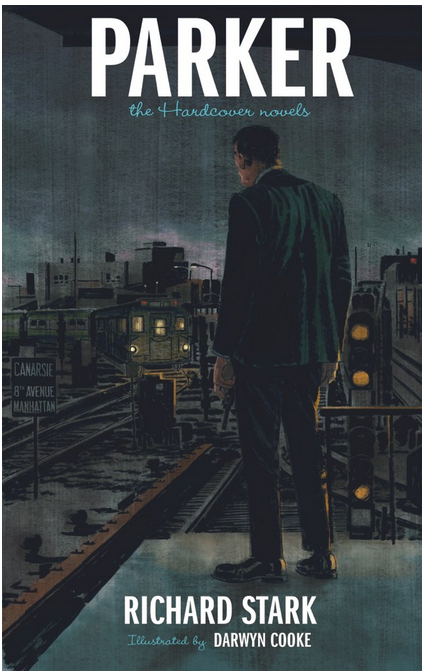 For the first time, the Parker novels will be published in a deluxe, hardcover format, and with Cooke designing the series, as well as providing stunning color illustrations to accompany Westlake’s (AKA, Richard Stark’s) crime classics! The first book, The Hunter, will arrive in the first half of 2014. Additional editions will be released in chronological order thereafter. Darwyn Cooke and IDW Publishing have released three Parker graphic novels to date, with the trio winning multiple Eisner and Harvey Awards. The fourth graphic novel, Richard Stark’s Parker: Slayground, will be released in December. Richard Stark was the most famous pseudonym of world-renowned author Donald E. Westlake. In 1962 he created the master thief Parker and began a series of novels that have been recognized as seminal works in crime fiction. Several of Westlake’s books have been adapted by Hollywood, including Parker earlier this year. He has won numerous awards for his fiction, including being named Grand Master by the Mystery Writers of America, that prestigious society’s highest honor. Well, they’ve figured out a way to get me to buy the Parker novels yet again. I was not crazy about the University of Chicago editions (the cover designs were bad and the text was riddled with typos), but I bought them all because I support the idea of the Parker novels being in print. My big question about this news is whether they will manage to release the entire run under the same imprint — something no publisher has ever managed. I would dearly love a matched set of all the Parker novels. Danggit, I want these, but I hate rebuying books I already own. My complete run on the Parker books is made up of a few University of Chicago Press editions, a Gold Metal paperback, a 70’s Violent World of Parker numbered book, a UK hardcover, a UK large print, Mysterious Press’s matchbook hardbacks, and plenty of the garish 80’s Avon books with the photo covers. But Cooke’s involved, so it’ll be hard to pass on them. It’s safe to say these new HCs will be far better editions than any of the others that came before. Congrats from me as well. Keep on writing. While I have, by no means read ayrwhene close to your total, I can say I’ve read nothing I would consider routine. One can tell you approach each book as if it were the first. With a lot of care. Clue AKA Cluelo and I were exchanging emails about these two series having deluxe HCs over the last couple years… Thank God for Darwyn “The Man” Cooke and IDW. A dream has come to fruition! And oh yeah, is the above cover not the freaking bees’ knees or what!? Cooke has outdone himself and captured Parker, yet again, so masterfully in a single image. If Cooke ran for Prez he’d have my vote! You nailed it, Greg. I’ve bought up all the used old copies I could find growing up, then bought the UoC copies just to have new, uniform looking editions – and now I have to start again. Not that I’m complaining…ha ha. This is great news indeed! I look forward to these editions and hope they do all 24 books. Dave – we put our collective energies together and the Travis McGee series was finally re-printed in a quality paperback edition. Now the Parker series in a quality hardcover edition. Anything else you want to mind meld over? LOL! Well, Clue, I don’t know… World peace? An inexhaustable free energy source for everyone? One thing about the above illustration: I really love the more realistic approach to Darwyn’s full color illustrations. The Parker comics are great, of course, but the style is more 60’s comic/cartoonish. Which, again, is awesome and works, but I REALLY love the direction he’s taking based on the new artwork. His talent as a graphic artist is fully evident and hugely satisfying in the above work. These new editions are gonna rock unlike ANYTHING we’ve seen before, methinks. Amazon says this is coming out May 27. Have they releases any more illustrations besides the cover yet? Looks so cool! Damn. I read Feb 14th somewhere. Guess I was way off. I just came across this article yesterday; you beat me to posting it here at VWOP, Tony! The illustrations I’ve seen so far are freaking sick (sick in the sense of unbelievably awesome). Cooke is one of my favorite humans, because he is continually making me more and more happy, as a Parker fanatic. I really really really hope Cooke does ALL the books, including the Grofields. I know that’s a tall order, but if there’s one person who could do it, it’s Darwyn. Having ALL the Starks in hardcover with his awesome illustrations truly is “sick” to the 9th power.